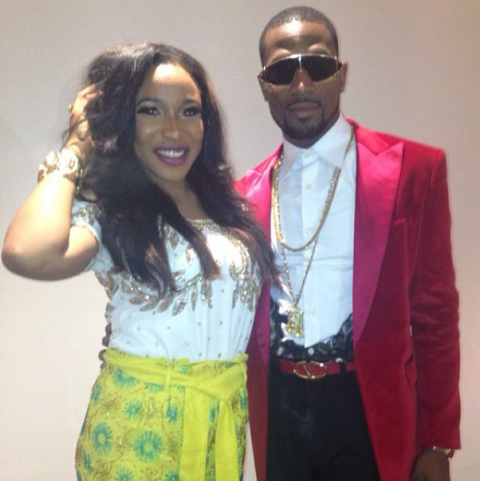 Tonto Dikeh And D’banj An Item?!? The latest gist in the rumor mill is that controversial actress turned singer, has found solace in the arms of the Kokomaster D’banj; when I say solace, I mean both emotionally and musically. Sources have claimed that Tonto Dikeh is like a permanent occupant at the Kokomaster’s Lekki mansion. Tonto is said to be working on a song in D’banj’s standard home studio, some times she works all day and into the night that she just retires into one of the numerous bedrooms in the house OR a specific bedroom. People that have spotted the two together even suggest that they are more than friends from the way the duo interact. Maybe Tonto is going to be the newest artistes added to DB Records or maybe she’ll be the latest kokolet added to D’banj’s trophies, who knows.